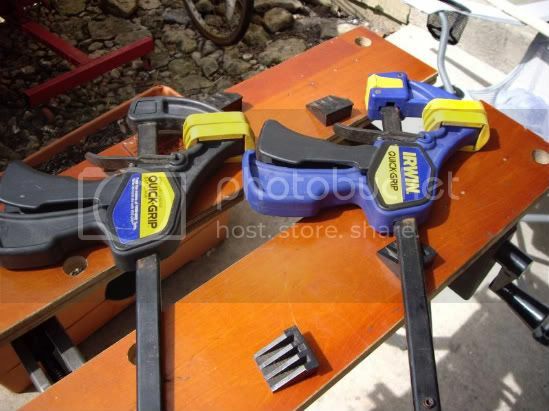 Another cheap option are a couple of these quick grip type clamps. I roughed out the Hop Hornbeam bow shown last summer on a camping trip. The stave was getting pretty close to shape. I set up camp, built a fire to get some cooking coals going, and clamped the stave to a picnic table and went to work. The clamps wont handle a lot of yanking but work once you’re being a little more delicate. Scraping follows the same theory as removing large amounts of wood. Brace the limb youre not working on against something solid, and go to work. This can be done in the bench also, but when I’m doing a little scraping, a little flexing, scraping, flexing, it gets a little tedious clamping and unclamping the bow. 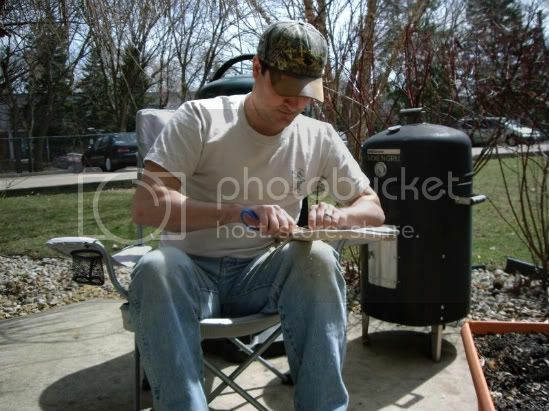 So my current method is to brace the bow on the propane tank, put it under my arm, over my knee and scrape. This way, I just scoot the chair forward and back depending on how far out the limb I’m working. After a round of scraping, stand up, limb tip on the toe and give a little flex. I’ll mark stiff spots with a pencil and go back to scraping. I follow this method until I get a reasonable floor tiller and can get the bow (carefully) strung. I have a long tillering string but I don’t care for it too much, personal preference. Without a way to back away and look at it, I don’t find it that useful. I have however, used the long string and just looked at the reflection in the patio door. Work out whatever works for you. Heres a shot of flexing for floor tiller. The next step is obviously achieving a floor tiller and starting the finishing tillering. I have two bows in this stage right now that I'm working at the same time. Since this is a pretty slow process to begin with, I'm not sure when I'll be returning with tiller pictures. I appreciate the interest and encouragement people have shown so far and will be sure to be taking pictures along the way. Despite having a couple days off this week I'm pretty busy but I'll resurect the thread when I have more material. This has been fun so far, hopefully I'll have a hunting weight bow to show off at the end. Again I'm no expert but if anyone has any questions, comments or suggestions, please post or PM me. Thanks again everyone. You do more with less than anyone I know. Makes me want to make some yella sawdust again. Thanks again for the kind words guys. That HHB bow is getting close to ready for the short string thanks to the great weather today. More pictures should be coming. Thats one of the problems with this kind of bowmaking, its pretty much a 3 season sport. Hey Dave, how you been? I just found the copy of Bowyers Journal you lent me in packing the apartment. (I'm moving back up to Wisconsin in the next month or so) My project down at Joliet is done so I'm not working down there anymore, maybe I'll have to mail it to you. Hope youre doing well. That boy of yours still eating you out of house and home? Ohhh ya, an excellent thread, keep it going. 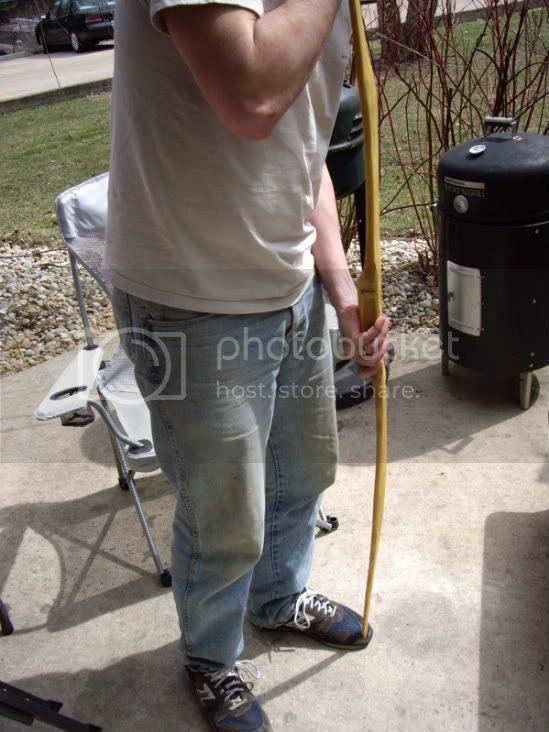 Brings back some memories, I built my first couple of bows with a hatchet, drawknife, four in one file, and a cabinet scraper. Not just yes, but Hell yes Jared! Way to get the chips flying and soon the arrows. Keep it coming. Sorry for the long hiatus, the last month or two has really gotten crazy for me. My wife got accepted to medical school in Milwaukee so we are back in Wisconsin and own our first home! So the poor guy with no shop now has a basement workshop and a garage. Unfortunately, right after moving in last week, my job sent me to California till mid July. 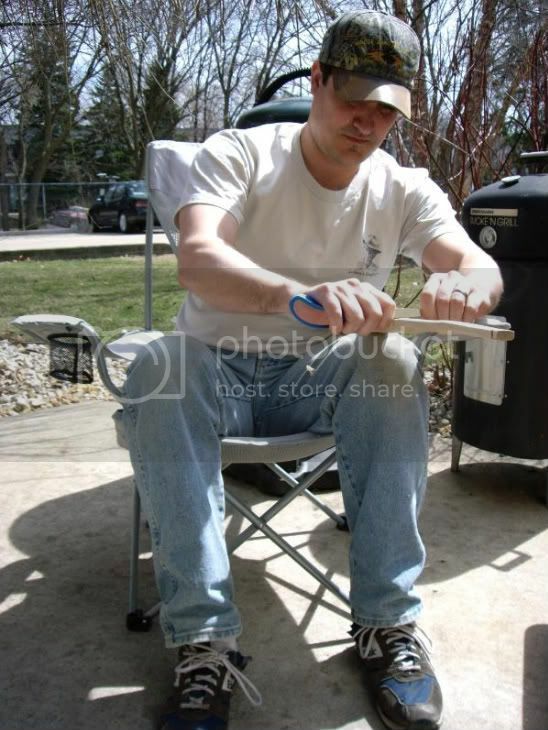 I fully intend to finish one of the bows that are still waiting in floor tiller stage this summer when I get back home with my old back patio methods to complete the buildalong. I'm really sorry for the delay, and want to say thanks again for all the encouragement, closure will come eventually! Its a big time in my life right now and I appreciate the patience. Take your time Jared, because we'll be here when you get back!